DYNAMIX 5V 1.5A Small Form Single Port USB Wall Charger. DYNAMIX 5V 1.5A Small Form Single Port USB Wall Charger. DYNAMIX 5V 2.1A Small Form Single Port USB Wall Charger. DYNAMIX 5V 2.1A Small Form Single Port USB Wall Charger. JACKSON Pocket-sized USB Charging Outlet, 2x USB Charging Outlets JACKSON Pocket-sized USB Charging Outlet, 2x USB Charging Outlets (3.1A total) with retractable cradle. JACKSON 2x Outlet Power board with 4x USB Charging Outlets. 3.4A. 0.9m JACKSON 2x Outlet Power board with 4x USB Charging Outlets. 3.4A. 0.9m lead. JACKSON Outbound USA Travel Adapter with 4x (3.1A) USB Ports. 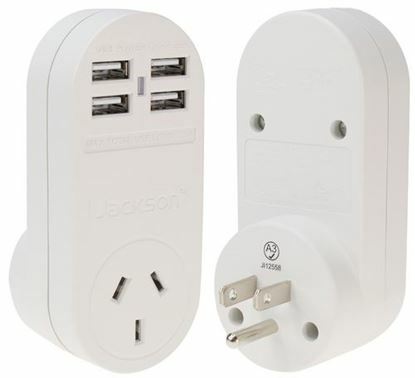 JACKSON Outbound USA Travel Adapter with 4x (3.1A) USB Ports. 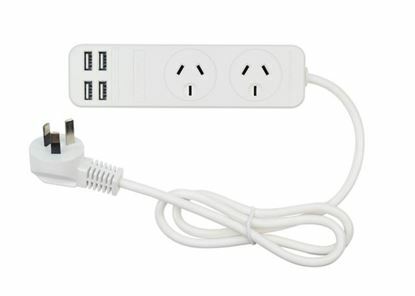 Wall Charger Converts NZ/AUS Plugs for use in USA, Canada and more. Power status indicator, Surge Surge Protector.